With tomorrow being Election Day I thought it might be fun to share with you a recipe for Election Day Cake. No kidding, there really was such a thing–and there still is if you care to make it. The custom of making a special cake for Election Day has a long history. Back in the early days of America, voters would have to travel great distances to cast their ballots, often to the state Capitol. Since only the men were allowed to vote back then, the women of the hosting towns would serve cake to the visiting voters. Election Day was a festive occasion calling for a special treat. 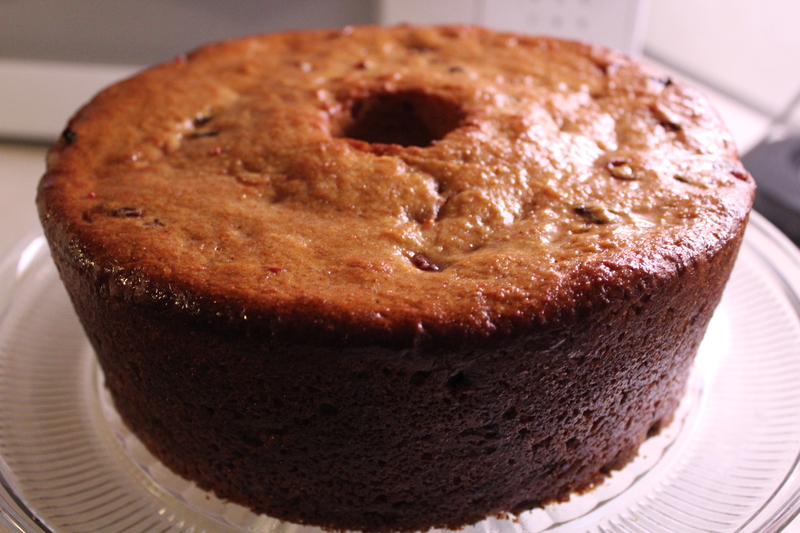 The Election Cake ( also called Hartford Election Cakes) is a yeast-raised fruitcake first reported as early as 1771 in New England, and then spreading in popularity across the country to the West throughout the nineteenth century. 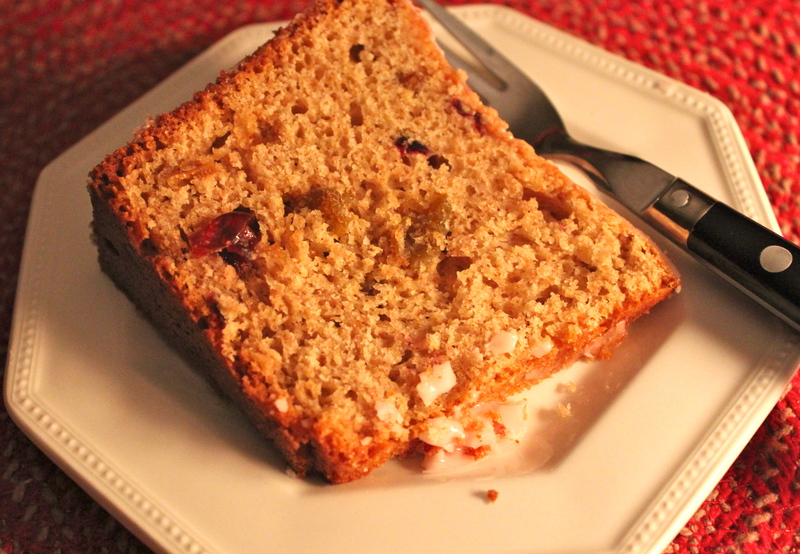 This cake is not heavy like a true fruitcake, but more cake-like with spices, whisky and colorful dried fruits, making this a delicious and patriotic treat. The recipe takes a good bit of time to make having several steps to it, but the end result is a very impressive tall, tube cake. Most of the syrup that the fruits were soaked in is used to brush on the cake as it cools adding some additional flavor and moisture. A small amount of the soaking syrup is also used to make the glaze topping. 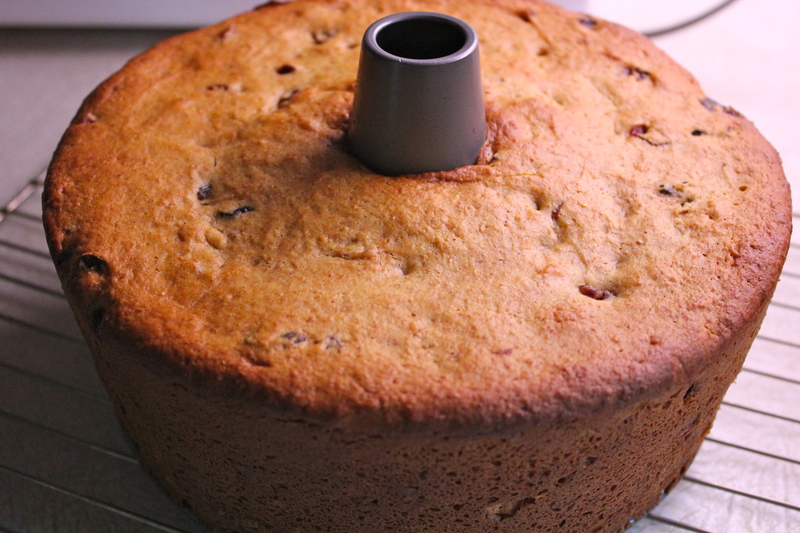 With whisky as a preservative and containing a good quantity of dried fruits that have been soaked in the whisky, the cake is definitely a keeper, I mean it keeps well. 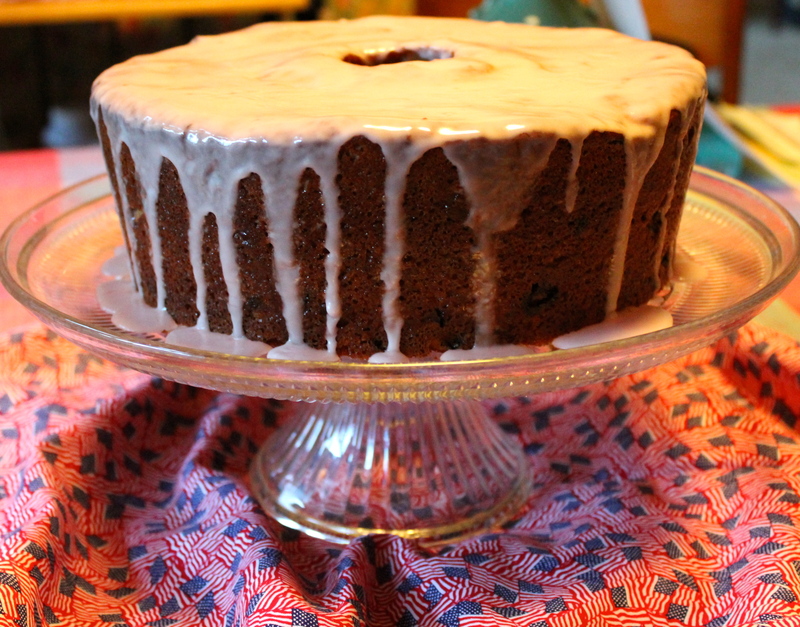 Cranberries, blueberries, and golden raisins soaked in American Whisky. 1. Grease a 10-inch tube pan or spray with non-stick baking spray and lightly flour. 2. Combine 1/2 cup of the granulated sugar with the water in a small saucepan. Simmer over med-high heat until sugar is completely dissolved. Remove from heat. 3. 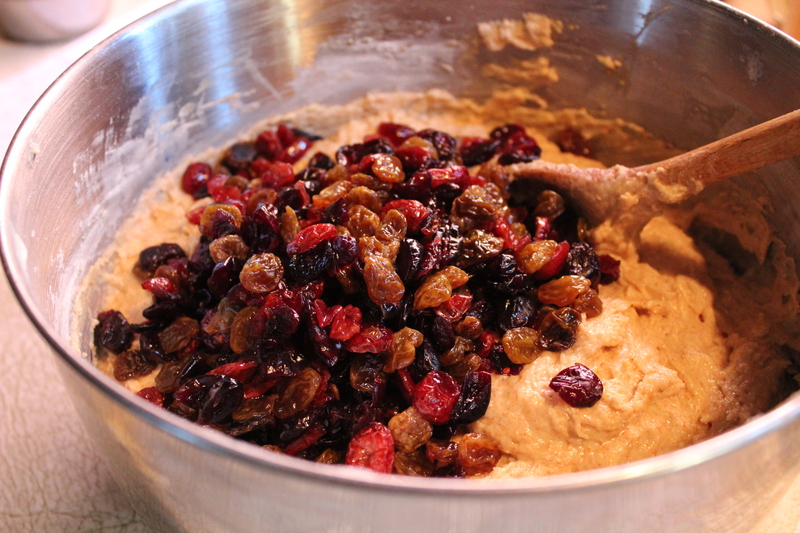 Place the dried fruit in a large bowl. Add the sugar mixture and whiskey; stir and set aside. 4. In a measuring cup, combine the warm water and milk. 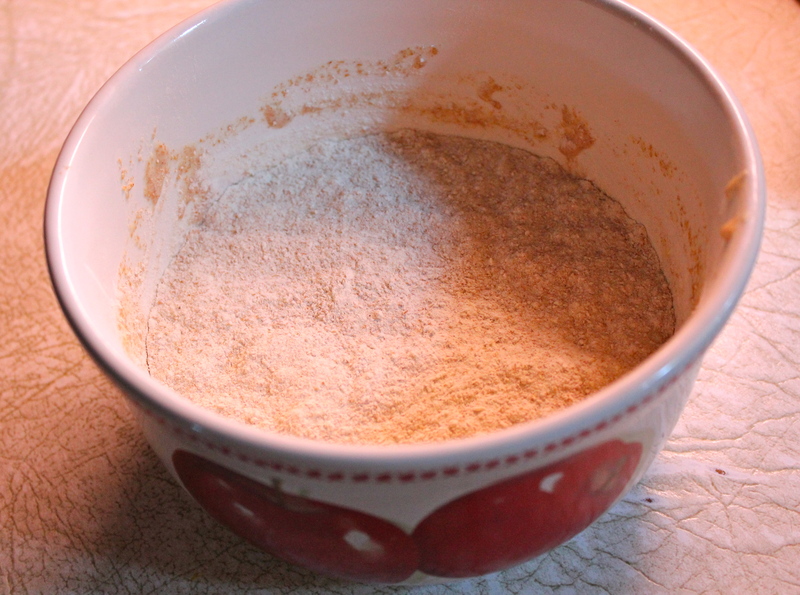 Add warm milk mixture to the yeast and whole wheat flour. 5. 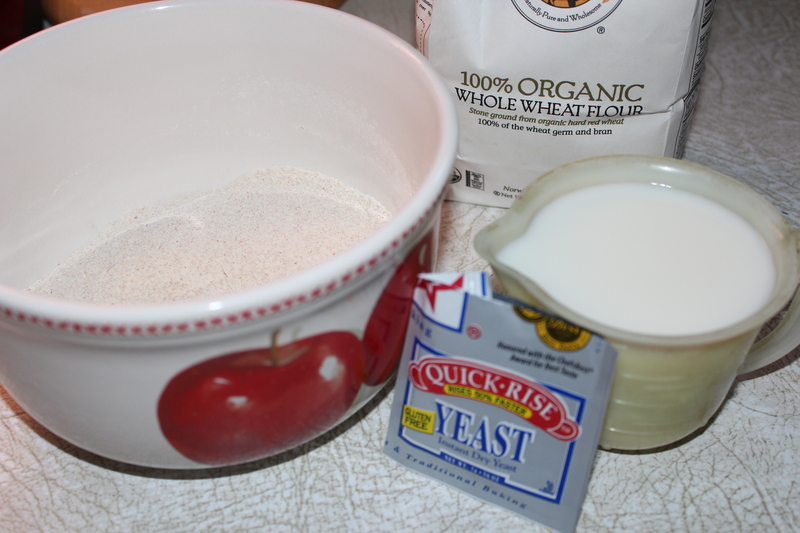 Combine yeast with 1 cup of whole-wheat flour in a medium bowl. Add the milk mixture and stir in. Sprinkle the remaining 1/2 cup whole wheat flour on top. Sprinkle 1/2 cup whole wheat flour over the top. Set aside to allow the yeast to ferment until the yeast breaks through the surface of the flour, approximately 30 minutes. This is called a sponge. “Sponge” is ready, when yeast breaks through top layer of flour. 6. Sift together the remaining dry ingredients and set aside. 7. 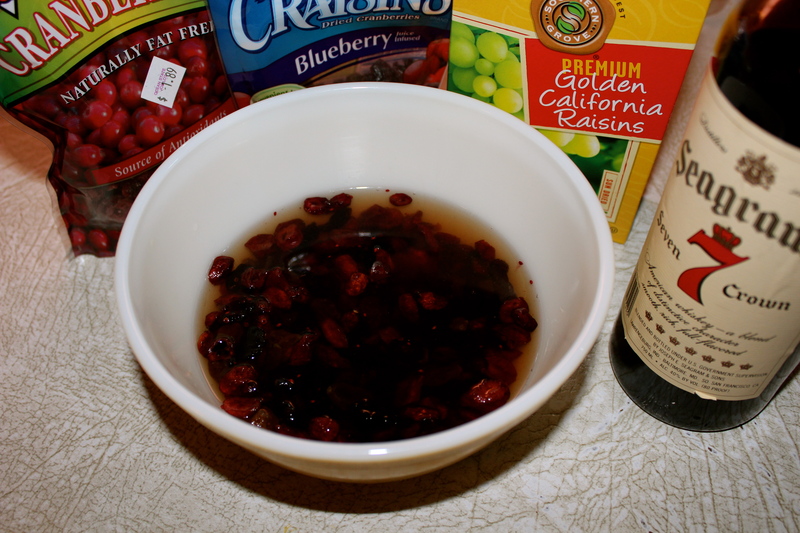 Drain the fruit mixture; reserve the syrup for later use in the glaze. 8. 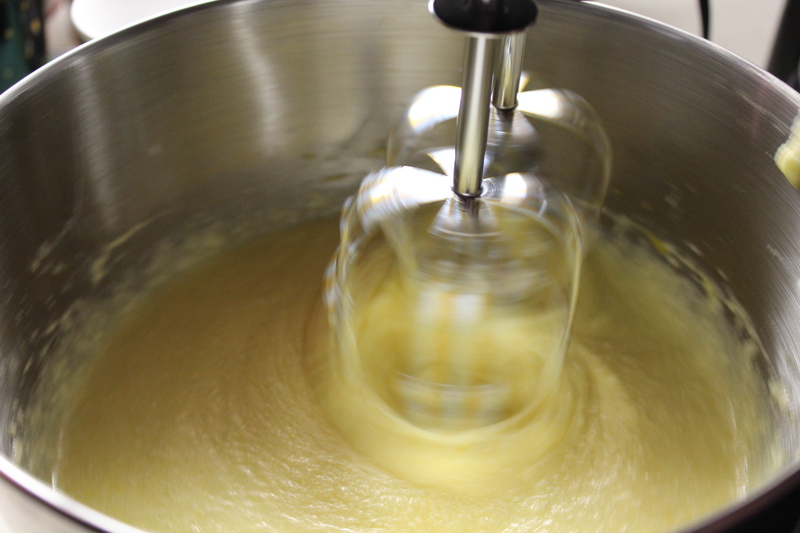 In a stand mixer, beat together the butter and the remaining 1 cup granulated sugar until light in texture. Add eggs one at a time, scraping down the sides of the bowl with a spatula after each addition. Beating in the eggs one at a time. 9. 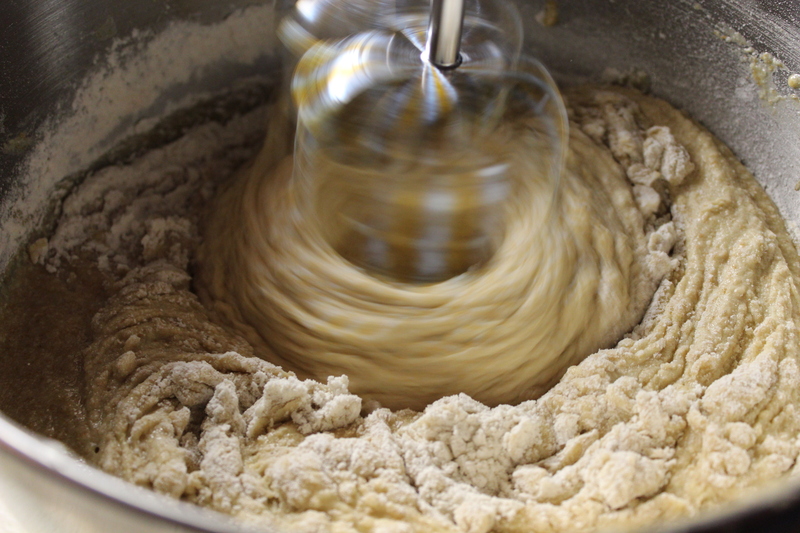 Turn the mixer to low speed and add the sponge; mix until fully combined. Beating in the sponge and dry ingredients. Add the remaining dry ingredients. The batter will be stiff. Stir in the drained fruit. Stir in the drained dry fruits. 10. Place the batter in the pan, cover, and set in a warm place to allow the cake to rise, approximately 1 1/2 to 2 hours. *** I gave my dough the full two hours and it doubled in size. Batter in the tube pan before rising. 11. Meanwhile, make the glaze: In a medium bowl, combine the 1 cup confectioners’ sugar and 2 Tablespoons of the reserved syrup drained from the fruit. Stir until smooth and set aside. 12.Bake cake in a 350 degree oven for 45 – 60 minutes, until a toothpick inserted into the cake comes out clean. A nice, tall tube cake after baking. 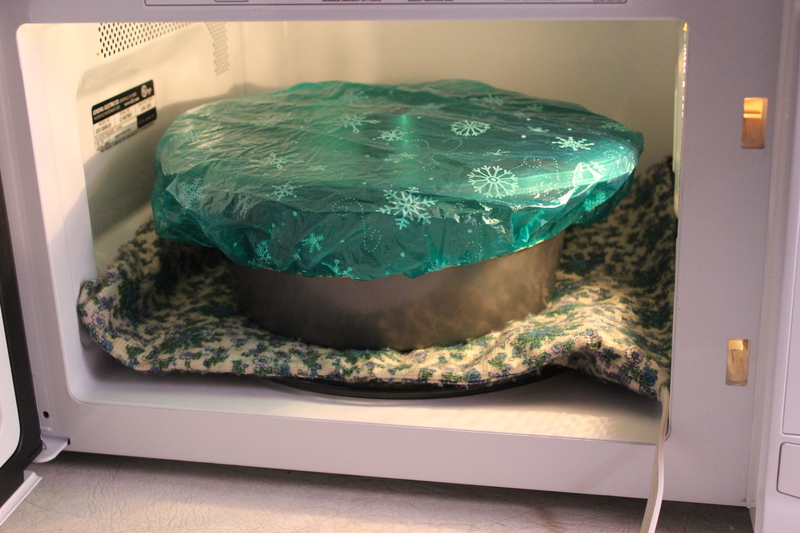 Allow the cake to cool in the pan for about 5 minutes, then transfer to a wire rack to cool. When cool, lightly brush the cake all over with reserved syrup, and finally top with glaze, allowing the glaze to drip down the sides. Brush cake all over with the fruit syrup. Frost with glaze, allowing some to drip down the sides. 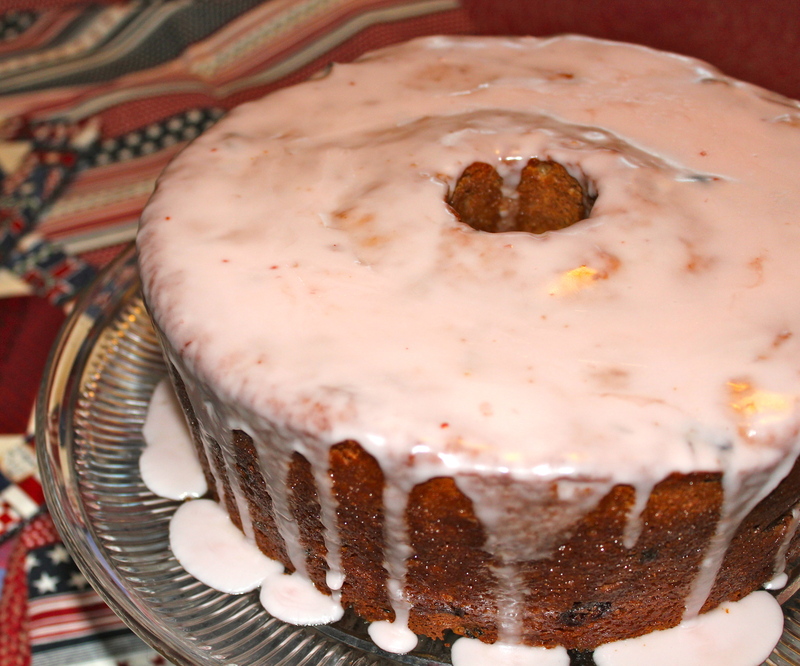 A tender cake, studded with bits of fruit, and lightly sweetened by the glaze. ***TIP: To provide a uniform temperature for yeast doughs to rise, set the bowl of batter on a heating pad set at LOW temperature. 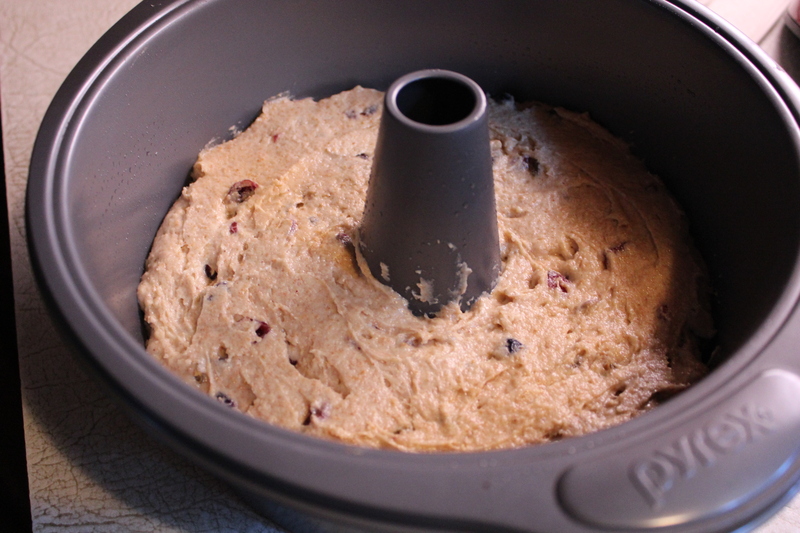 The microwave oven provides a draft free place to raise yeast doughs. Works beautifully! 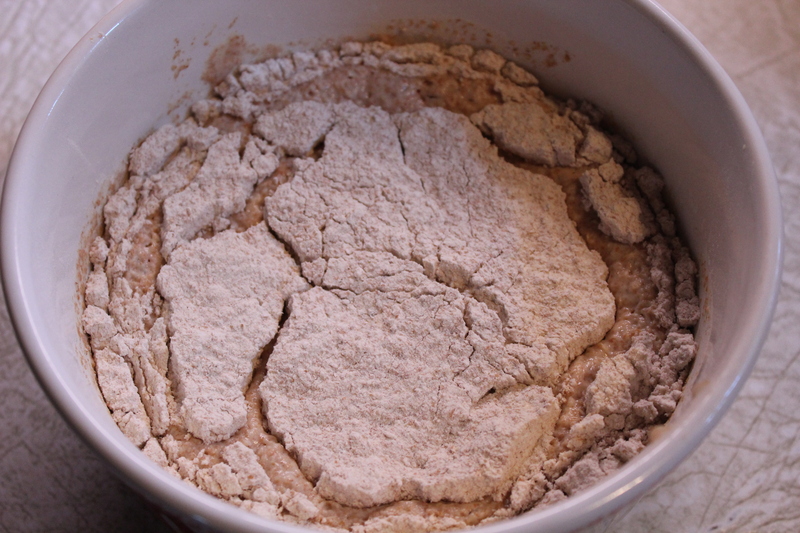 Cover yeast batter, place in microwave oven on a heating pad set at LOW temperature. Over the course of the last few years I’ve been moving away from buying ready made foods like cereals, soups, sauces, etc. and making more and more of these items myself. My reasons are threefold; environmental: less packaging to dispose of; health: I can eliminate all those unpronounceable ingredients, and have better control over what we are eating; and emotional: I feel really good knowing I can make it as good or better than what’s in a package. 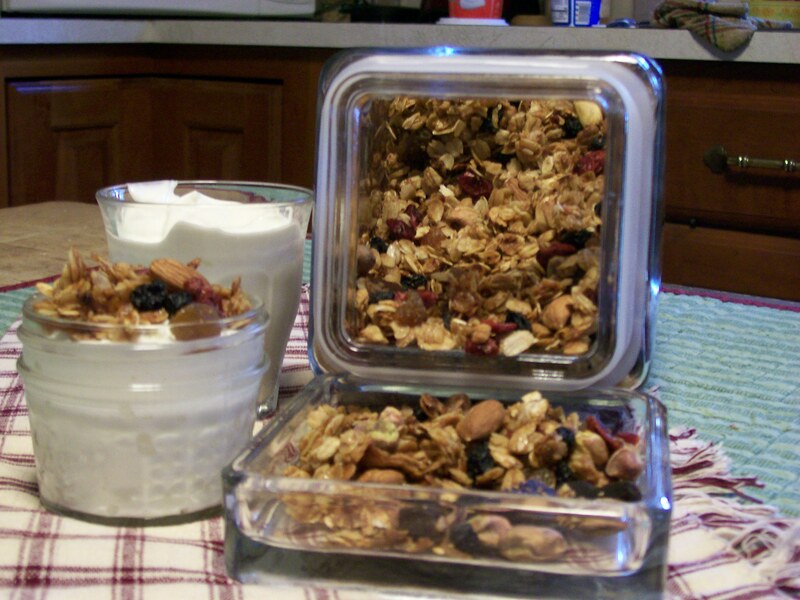 Granola is one of those packaged items that I have ceased buying and now make at home. 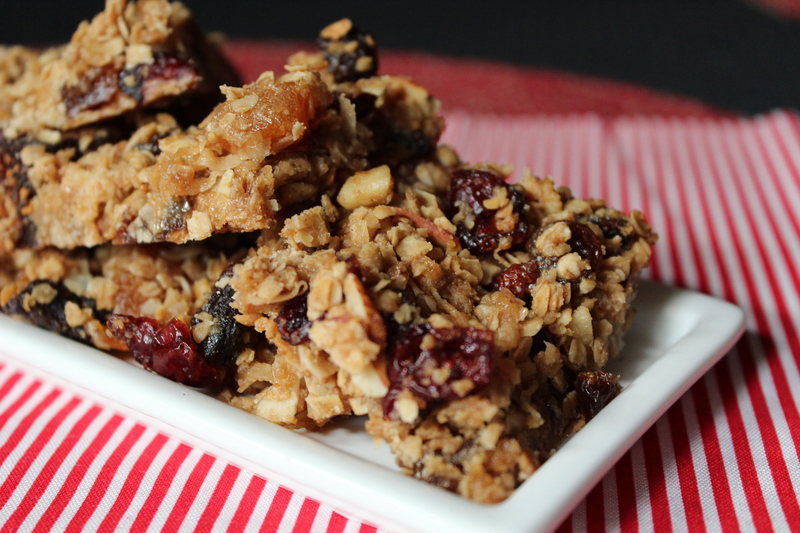 Granola is very versatile. It can be added to foods, as in a crumbly topping on a fruit cobbler, put on foods to add crunch, like over fruits, or ice-cream, or eaten out-of-hand as a snack. 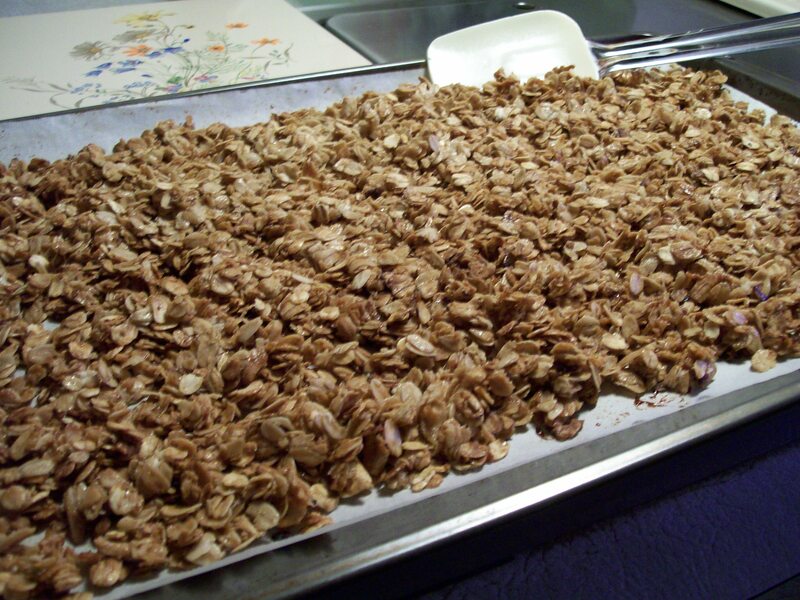 So with that said, I have been making homemade granola and spreading it around rather liberally. My lunches consist, for the most part, of fruit smoothies, or yogurt with granola on top; and for my husband, I send him off to work with a nutritious salad for lunch, and a bag of granola for a mid-afternoon snack. 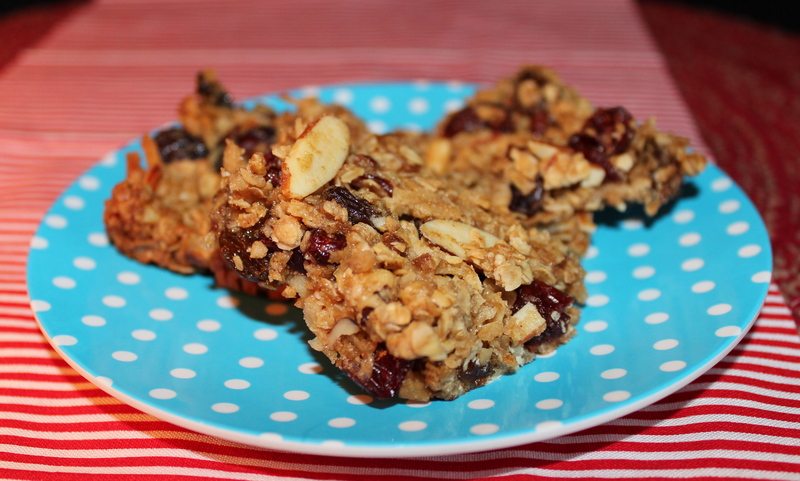 Each time I make it I vary the fruits and nuts I put in it, so it does not become boring. For anyone who needs a quick “grab and go” breakfast, or who brings lunch to work, yogurt and granola is a delicious, good-for-you duo. I like Greek style yogurt because it’s thicker than regular styles, and because it packs almost twice the protein, so you’re not as likely to get the mid-morning munchies. You can also stretch your budget by purchasing the large size yogurt and putting it into smaller 8 0z. containers. 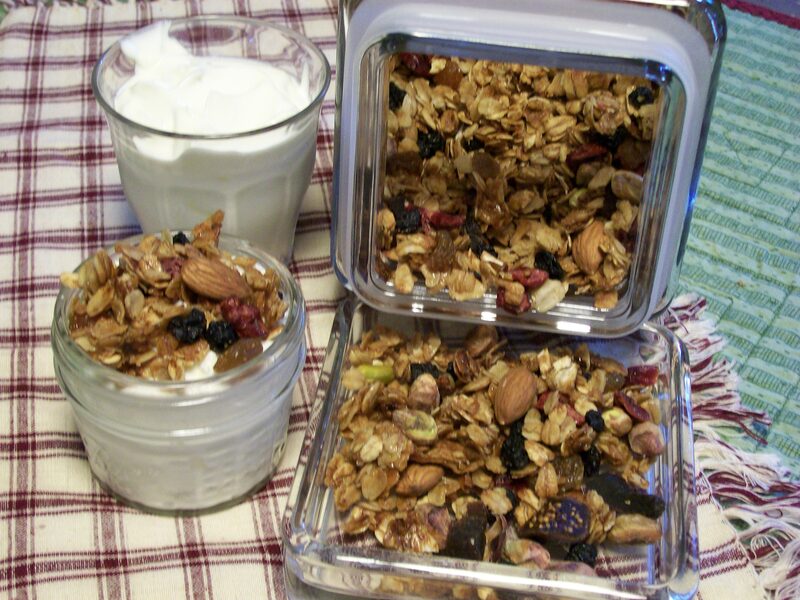 Likewise package your granola in baggies, so when you’re ready to leave the house, just grab one of each and you will be on your way with a breakfast or lunch that is economical, delicious, and good for you. Have all your ingredients ready before starting to assemble. 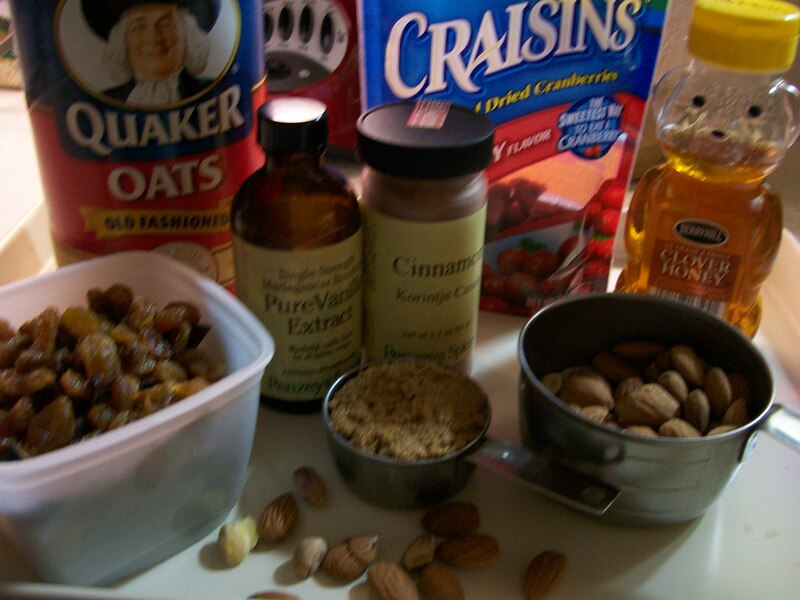 2 cups add-ins, like dried cranberries, cherries, apricots, figs, raisins; coconut, nuts such as almonds, pistachios, walnuts. 2. Whisk together oil, honey, brown sugar, vanilla, cinnamon and salt in a glass measuring cup. Heat briefly in microwave ( 1 minute at 50% power) to blend and melt any sugar lumps. Stir well, then pour over oats in a large bowl and toss to coat. 3. Spread mixture on prepared baking sheet. Bake for 20 minutes or until golden brown, stirring every 5 minutes. 4. Let cool slightly, then transfer back into large bowl and stir in add-ins. Let cool completely before packaging, or store in air-tight container for up to 2 weeks.